The Department of Foreign Languages was founded in 2001 as a result of reorganization of the Department of Foreign Languages and Methods of Teaching. Since 2013 the department is headed by N. M. Andriichuk, Candidate of Pedagogical Sciences, Associate Professor. In September 2014 due to the implementation of the project “Language Strategies” within Zhytomyr Ivan Franko State University and the necessity of teaching students of non-linguistic specialities according to new technologies, the Department of Foreign Languages was renamed into the Department of Foreign Languages and the Modern Teaching Techniques (e-mail: inozem.mov@gmail.com). Currently, the department staff is represented by 24 members, including one professor, two associate professors, 4 senior teachers. 8 teachers of the department have a Degree of Candidate of Sciences, 1 of which is a Candidate of Philological Sciences and 7 are Candidates of Pedagogical Sciences. Research work of teaching staff is conducted within the department scientific theme: “Language Education in Modern Specialists’ Training”. The Department of Foreign Languages and Modern Teaching Techniques serves all departments of the university and provides teaching of foreign languages for students of all specialities and qualification levels of “Bachelor”, “Specialist”, “Master”. The list of disciplines provided by the department, includes “Methods of Teaching Foreign Languages”, “Innovative Technologies of Teaching English in secondary school”, “School Course of Foreign Language Methodology Training”, “Development of Intercultural Competence by Means of English”, “Foreign Language (Basics Academic Writing)”, “Foreign Language”, “Special Course of World History in a Foreign Language”, “Foreign Language for Professional Purposes”, “Business Foreign Language”, “Professional Literature in a Foreign Language”. The main foreign languages are English, German and French, other languages (Spanish, Polish) are optional at the students request. Technical means, new technologies and modern methods of teaching foreign languages are widely used within the classes. The use of modern technology and teaching methods in teaching foreign languages for non-linguistic faculties. Textual linguistic problems in cognitive linguistics. Functional semantic and pragmatic features of language units. Humanitarian training of future teachers for the work in an inclusive environment. Historical pedagogical and geographic bases of teachers’ training. Psychological pedagogical foundations of professional training. 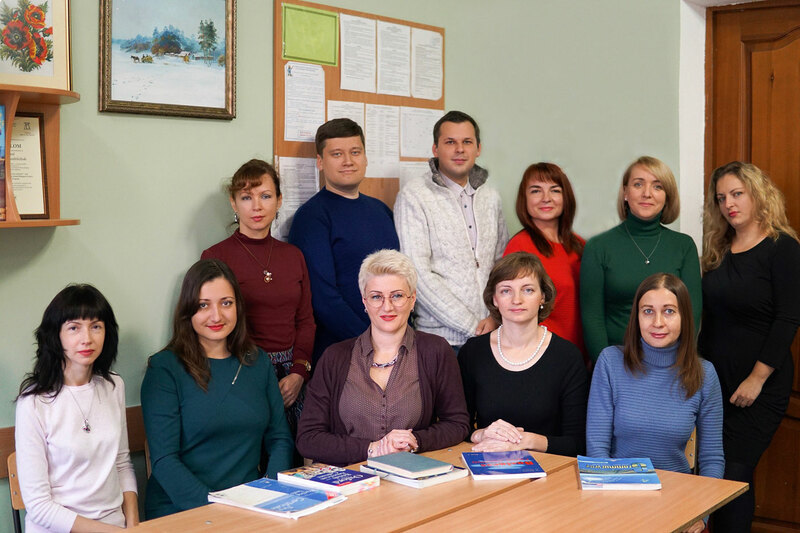 Within the department there is a Scientific and Research laboratory “Linguistic background of modern professional training” under the guidance of Head of department N. M. Andriichuk, associate professor. The research laboratory was established on May 31, 2011 (order № 155) in Zhytomyr Ivan Franko State University in order to implement the practical realization of traditional and modern models and technologies in the process of specialists’ foreign language training (including distance form), borrowing foreign experience of the teacher’s work in an inclusive environment and its adaptation to the education system of Ukraine. The research laboratory contains 15 members, 8 of whom are the Candidates of Pedagogical Sciences. Members of the laboratory have issued two monographs: “Public Teacher Training in Teachers’ Seminaries in Ukraine (1860-1917)” and “Professional Training of Primary School Teachers in England in Terms of European Integration”, two guidance manuals “Pedagogics of Higher School” (Bilingual Guide) and “Foreign Language Literature for Children”. They have published 29 articles (18 of which are professional), 4 theses at conferences. N. M. Andriichuk is a co-author of collective monograph “Great Volyn: History of Education and Culture”. Scientific and Research laboratory “Linguistic Background of Modern Professional Training” was presented at the Interdepartmental US agencies conference which is engaged in programmes of studying and teaching English in Ukraine: “English Language Education: A United Approach”. The Department of Foreign Languages and Modern Teaching Techniques provides an annual National Scientific Webinar on “Features of Teaching Foreign Languages for Students of Non-Linguistic Specialties”. The webinar is organized in the form of a teleconference between Zhytomyr Ivan Franko State University, and leading universities of Ukraine. The event promotes the rise of a scientific level of teachers in the context of the possible borrowing experience of colleagues to improve their own teaching practices; helps the development of professional abilities, expands scientific horizons and develops intellectual potential of educators. As a result of the webinar, there is an electronic theses collection which represents original research on important problems of methodology of teaching foreign languages for students of non-linguistic specialties. An important role in shaping of the creative potential of future specialists plays students’ participation in an organized and systematic research work. The task of students’ research activities in universities is to develop their skills in research and creative solving educational problems while working at school and in forming skills of applying the methods of scientific research in practice. Due to participation in scientific work students manage to deal with various information sources. In the practice of the department of foreign languages and modern teaching techniques the following types of students’ scientific explorations such as research related to the implementation of educational objectives; students’ problematic groups; bachelor’s and master’s papers; participation in national and international conferences organized by the department are the most common. National Scientific Students’ Conference “Specialist of the 21st Century: Professional Linguistic Competence”, 2014.
International Scientific Students’ Conference “Transformation of the Language Image of Modern Scientist”, 2015. Specialist of the 21st Century: Professional Linguistic Competence: materials of Ukrainian scientific practical conference for students of non-linguistic specialties: Zhytomyr, April 15, 2014. — 126 p.
Transformation of the Language Image of Modern Scientist: materials of International Scientific Students’ Conference for students of non-linguistic specialties: Zhytomyr, 15 April 2015. — 150 p.
An important aspect of involving students to research is functioning of the problematic group: the “Development of Professional Skills of Teacher-Philologist in Teaching a Foreign Language” under the guidance of Professor O. E. Misechko. A group of senior students of the Institute of Philology and Journalism and the Institute of Foreign Languages is involved. The main areas of work are: scientific and methodological principles of students’ research work; training teachers-philologists with dual specialty in the history of national higher educational schools; technique formation of reading English texts aloud based on phonetic method; forming cultural competence by means of English folk material; using the method of complete physical reactions in the study of English for primary school children. During the first term of 2014-2015 academic year scientific problematic group consisted of 14 students. Student of the Institute of Philology and Journalism Tatiana Novikova, a member of the problematic group won the first prize in the Ukrainian competition of students’ research papers (m. Kharkiv) in the specialty “Theory and Methods of Professional Education” and received an award. During the period of 2014-2015 academic year the technologies of distance learning were tested on the basis of the department. Testing included the development of content of the web resources curriculum (subjects) and control of their quality and relevance to the educational standards for efficient use of resources in the educational process. The work of distant portal is organized on the basis of MOODLE platform. MOODLE (Modular Object Oriented Distance Learning Environment) is the name of the system software CLMS (Content Learning Management System), which is distributed freely on the principles of Open Source license. With the help of this system the student has an opportunity to study through the internet, do the tasks and send it for reviewer. The educational material can be presented in the form of information resources of different types (text, video, animation, presentation, e-book). The teachers can create their own e-learning courses and upload them, send messages for students, distribute, collect and check tasks. O. O. Makarevich is responsible for the technical maintenance of the system of distance learning. The electronic courses are available at http://moodle.zu.edu.ua. An important aspect of the department activity are the foreign languages optional courses. The project was established in 2003 in Spanish and French. It was successful and continued to receive full support of the Rector, Professor P. Y. Saukh and the Director of the Institute of Foreign Languages, Professor. A. V. Synhayivska. Optional courses provide studying of various languages including English, Spanish and Polish. The optional courses last from October to June. According to the curriculum total number includes 100 hours of classes that are taught over two terms. Educational process isbased on a modular credit system that provides continuous monitoring of the success of students. The leading approach of courses provided by the department is the communicative one. Its essence is in development of basic language skills of students: speaking, listening, writing and reading. After the training students take the exam, which is fixed in the annex to academic diplomas. 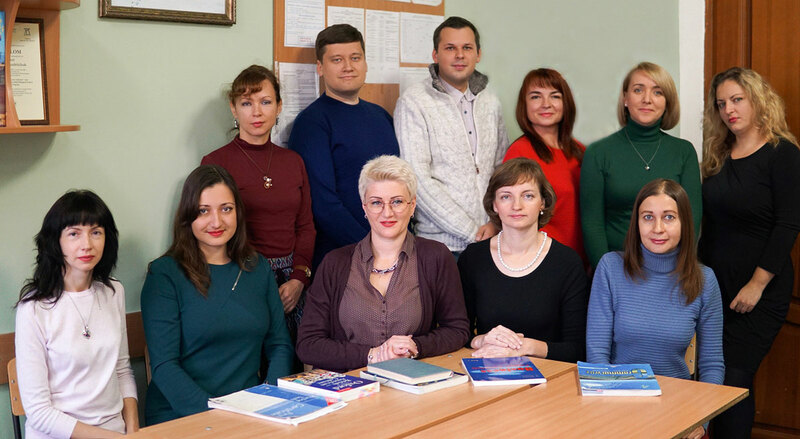 To increase the level of foreign language of university teaching staff, the Department of Foreign Languages and Modern Teaching Techniques organized a group to study a foreign language (English) for teachers of all faculties and institutes as well.